Questions for Littles: What days does v32 tell us to recall? After they were illuminated, what did they endure? By what were they made a spectacle (v33)? Of whom did they become companions? What did they have upon the writer in his chains (v34)? What did they joyfully accept? What kind of possession did they know that they had in heaven? What are we commanded not to cast away in v35? What do we have need of in v36? After we have done what, will we receive the promise? After a little while, what will happen (v37)? By what does the just man live (v38)? But if a man is not just, and does not have a real faith by which he lives, but instead draws back, in what does the Lord’s soul have no pleasure? Of what group are we not a part (v39)? Who go to perdition? How does it end for those who believe? In the second half of week’s sermon text, the Scripture instructed us to look back and to look forward. Look back. The love and zeal that you had at first—do you have it now? Are your treasures in heaven and your pleasures in being identified with Christ? Or is your treasure on earth, so that suffering can rob you of pleasure? Look forward. Yet a little while, and Jesus will come and not delay. Does confidence in that day have you pressing forward and enduring? Does belonging to the Master have you doing His will while you wait for His return? This is one way that we can gauge whether we are drawing back or enduring: look back and look forward. If you are beyond where you were, and still straining forward to where you will be, then you are enduring. But, what if you look back in time and find that you once lived as someone who values Christ above all, but now would much rather be comfortable and complacent rather than devoted and suffering? Repent! Behold Christ and His glory all over again! How? Where? By the means described in v19-25. Renew your commitment to visiting heaven with the congregation each Lord’s Day, and to the fellowship in which we stir one another up to the love and good works that serve our Master! 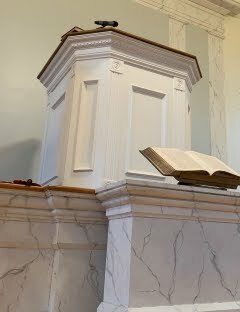 For what kinds of things do you miss Lord’s Day worship? What kind of fellowship do you try to have on the Lord’s Day? How do you try for it? Questions for Littles: Who was hungry in v12? What did He see from afar (v13)? What didn’t He find upon it? What does Jesus say to it (v14)? Who heard Him? To where did they come in v15? Where did Jesus go? Whom did He drive out? What did He overturn? What would Jesus not allow in v16? Then what did He do to them (beginning of v17)? 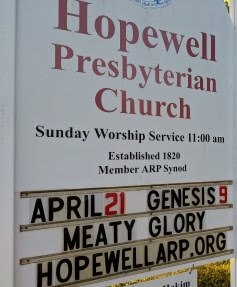 What did He teach them that the temple was to be called? For whom was it to be a house of prayer? When Jesus expected to find this fruit on it, what did He find instead? What did the scribes and chief priests want to do to Jesus (v18)? Why didn’t they? In the morning on their way back into the city, what did they see (v20)? What does Peter say (v21)? What does Jesus command them to have in v22? Which mountain does He tell them that God will remove if they ask (v23)? What are we to believe, regardless of what we ask in prayer (v24)? What must we always have done before we pray (v25)? What won’t God do, if we do not forgive (v26, cf. Mt 6:15, 18:35)? In the Gospel reading this week, we come upon a sobering passage about the Lord’s rejection of the Mosaic covenant. In Judges 9:11, Jotham had referred to Israel as a fig tree, and Jesus picked up this word picture for Israel earlier in His ministry in Luke 13:6-9. There, He specifically referred to it as planted in a vineyard, picking up one of the most well-known metaphors for God’s displeasure with Israel’s unfaithfulness in Isaiah 5. When we take those things into account, it becomes clear why vv15-19 are sandwiched on both sides by the cursing of the fig tree and the Lord’s teaching about it. Israel was supposed to have been a light to the nations. v17 quotes Isaiah 56:7 which is picking up a theme from Isaiah 45:14. Jesus isn’t having a supernatural temper tantrum about missing out on a figgy breakfast… it wasn’t even the season for figs. What He is hungry for most of all is to do His Father’s work of gathering in the nations (cf. John 4:27-42)! The nation of Israel is the fig tree, and that is the fruit that was missing and the reason for their rejection. What’s frightening for the apostles is that as they climb up Mt. Zion into Jerusalem, at the top of that mountain is an impressive physical structure, political structure, and religious hierarchical structure. And the powers at the top of that mountain are all trying to destroy Jesus. The promise about the mountain is not about excavation of dirt but rather success of the great commission. Have you ever noticed that v23 refers to this mountain? It’s referring to the temple mount! How will the apostles topple it? They won’t. Jesus will, in response to their prayers. It’s better to read v24 without supplying the direct objects, “whatever things you ask when you pray, believe that you receive, and you will have.” These things are being asked for in a context: the mission of the church. And Christ WILL build His church! One last thing: such dependence is essential because we come to Christ not as those who do so by works and stumble over Him, but as those who are needy of forgiveness. We cannot afford to be works-based, which means we too must be a forgiving people (v25-26). Let no man think that he is about the business of the kingdom if he shows not the forgiveness of the King! What’s your part in the Great Commission? For what do you pray? Whom do you need to forgive? On this side of the cross, it is not so difficult to know how this can be. The LORD Himself became a man, our Redeemer, the Lord Jesus Christ. His hands have always been perfectly clear. His heart pure. His soul faithful. His lips true. Christ alone is worthy, and we must cling to Him alone as all of our worthiness! Questions for Littles: How might one sin, even after he knows the truth (v26)? What, then, no longer remains for him if he does so? What certain, fearful expectation would he have (v27)? What will devour God’s adversaries? For rejecting whose law did people die without mercy (v28)? How does the punishment for rejecting the gospel compare (v29)? When someone rejects the gospel, Whom do they trample underfoot? What do they treat as a common thing? What have they done to the Spirit? Who says, “Vengeance is Mine; I will repay” (v30)? Who will judge His people? What kind of thing is it if you fall into the hands of the living God (v31)? In the sermon this week, we moved from last week’s great privilege and duty to an equally great warning. Man’s chief end is to glorify God and to enjoy Him forever. But, if we will not glorify God by enjoying Him, we will still most certainly bring glory to His infinite perfections—not just His justice and holiness, but also even His love. How great is God’s love, that He has given us His Son! And therefore, if we know that He did so, and still are not battling against our sin, God’s wrath will glorify His love by devouring us in fiery indignation. How great is God’s love, that He has brought us into everlasting covenant with Himself, and that by His own blood! And therefore, if we know that He did so, and still are not battling against our sin, God’s wrath will glorify His love by devouring us in fiery indignation. How great is God’s love, that He has given us His own Spirit to work in us by His own strength! And therefore, if we know that He did so, and still are not battling against our sin, God’s wrath will glorify His love by devouring us in fiery indignation. We see now how vital it is that we employ Christ’s appointed means for battling sin: gathering for Lord’s Day worship to hold fast to Him together, and being called alongside one another to stir up love and good deeds. The real question for us is: what use will we make of these means that He has so lovingly provided? How can you tell whether you are genuinely devoted to Lord’s Day worship and fellowship?